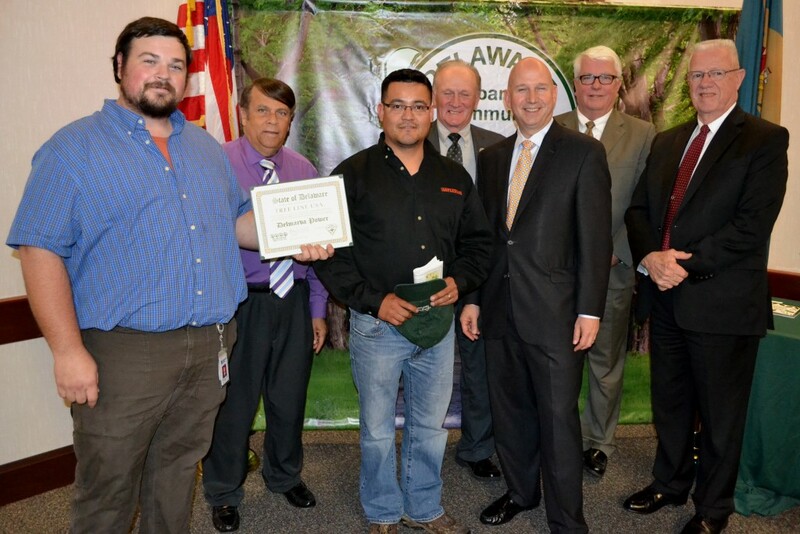 (from left) Michael Krzyzanowski of Delmarva Power receives the Tree Line USA Award joined by Dover Mayor Robin Christiansen, George Vasquez of Asplundh Tree Expert Company, Rep. David L. Wilson, Gov. Jack Markell, Sec. of Agriculture Ed Kee, and Rep. Harvey Kenton. Every day in communities all across America, people depend on safe, reliable electric service to power their homes, businesses, and public buildings – all while protecting and enhancing the urban forest. The Arbor Day Foundation collaborates with the National Association of State Foresters on this initiative. These state foresters bring expertise in balancing the demands of expanding utility needs in our communities alongside the benefits of providing adequate care for our urban forests. Quality Tree Care — Industry standards for pruning, planting, removals, trenching, and tunneling near trees are consistently followed..
Arbor Day Celebration — Sponsorship of or participation in annual Arbor Day events at the community level are documented, including collaboration with community groups whenever possible. Utility companies that comply with these core standards are welcome to print and submit a Tree Line USA application form to enroll.